The practice of resilience assessment requires some key conceptual framings. One, as in the Nature of Cities roundtable that I discussed last time, is around the questions of whether and how to measure the resilience of people-in-place. Another is around the standpoint of the assessor to the assessment. In other words, should the assessor’s emphasis be on evaluating efforts, independently and objectively? Or should it rather be on supporting such efforts, collaboratively, based on a transdisciplinary approach? Basically, is the goal of resilience assessment to evaluate resilience or to build resilience? And, if both, are there trade-offs in attempting to adopt the two standpoints? It helped implement and advance their sustainable development work. 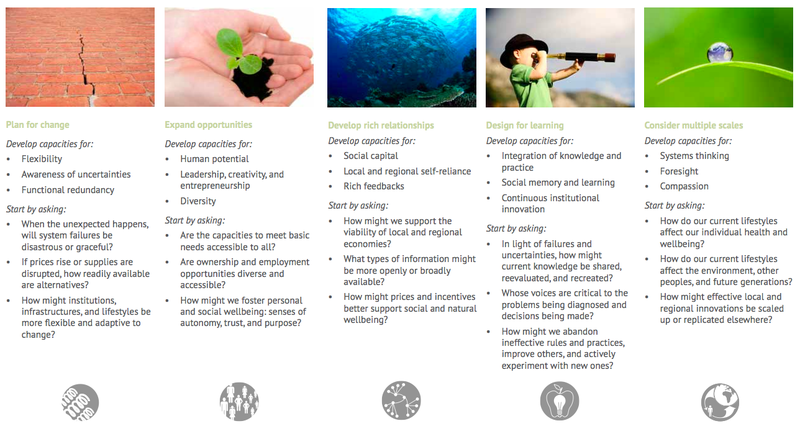 All the identified themes of contributions of the resilience assessment, which these three categories build upon, are presented with examples in Appendix 5 (pdf). Essentially, the focus of resilience assessment in this paper is on capacity building among assessment participants or stakeholders. Resilience as capacity building was also the framing that my Ecotrust colleagues and I used in the 2012 publication, Resilience & Transformation: A Regional Approach. At top is the framework we developed (larger image). See also: Michael Quinn Patton on comparing logic model and developmental evaluation. 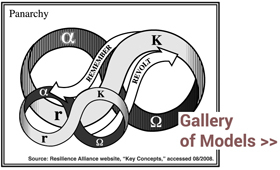 The term resilience has specific meanings in engineering, psychology, and ecology. What might it mean for people-in-place to be resilient? A region, say, as my Ecotrust colleagues and I examined a few years ago, or a city or a neighborhood. Twenty-one respondents from around the world weighed in with their thoughts and experiences. Participatory practices caught my eye. Richard Friend and Pakamas Thinphanga in Bangkok described their use of shared learning dialogue and of a UNISDR Local Government Self-Assessment Tool. William Dunbar in Tokyo described community-based use of an International Partnership for the Satoyama Initiative (and partners) indicators toolkit. With regard to measurement, there was a fair amount of skepticism as well, notably from ecologist Lance Gunderson, co-editor of the book Panarchy: Understanding Transformations in Human and Natural Systems. When faced with a new type of collective problem, we try to gather information in order to develop an understanding that helps direct how we act or intervene. In this case, trying to understand and direct trajectories of cities or urban centers over time, the concept of resilience has become part of the discourse. In efforts such as the Rockefeller Foundation’s 100 Resilient Cities, or NOAA’s Coastal Resilience program, resilience is the central organizing theme. Implicit in these programs is the use of resilience as a normative term (as in a city or coast should be resilient). Yet there are a number of resilient facets of cities, such as slums, impoverished economic zones, or air-pollution zones that are very resilient. Such areas can be quite resilient, yet are not desirable. Attempting to measure or index resilience (and there are lots of folks that say they can measure resilience) creates a spurious certitude that is likely to drive maladaptive actions and constrain creative and productive actions that may help change unwanted trajectories. Here’s a concise video introduction to topics at the intersection of psychology and nature, from Thomas Doherty. Ten-or-so years ago, Thomas led a monthly Portland discussion group called Green Minds, which became a locus for thoughtful conversation among a cross-section of the city’s nonprofit workers, social entrepreneurs, and so on. He was founding editor of the journal Ecopsychology, and a glance at that link or at the schedule for the Oregon Ecopsychology Symposium, starting tomorrow at Lewis & Clark College, offers a sense of where the field is at today. Bibliographic annotations to the video are in this document. Someone give this guy a TEDx stage! One cannot, David Hume wrote, logically deduce ought from is. Take this Humean example: The “is” that humans are changing the Earth’s climate cannot necessitate the “ought” of how to act. Simple (and devastating) as that? Consider this designerly reframing. Instead of the is/ought dichotomy, start with the knowing/acting duality. We each experience the world outside, and from such experiences, we each develop ways of knowing. Socially learned and competent ways of knowing are called science. While some specialize in science, each of us must develop the rudiments of a scientific stance — ways of understanding the world outside — in order to get by. We each act in the world, and some activities are purposefully designed. By design, I mean the development of inquiries and activities through which we seek to examine and shape the individual, social (institutional, cultural, material), and ecological affordances and constraints that shape, in turn, our lives and activities. While some specialize in design, each of us must develop the rudiments of a designerly stance — ways of engaging with the world outside — in order to get by. Given this reframing, here’s a question: in service to acting, as informed by knowing, whence the oughts (emotional sensing and logical-ethical reasoning)? In other words, what roles do sensing and reasoning, emotional-logical-ethical, play? I write this after reading Stuart Kauffman, who has often returned to this topic, in the context of evolutionary biology. For Kauffman, oughts are not ancillary; they are fundamental. In my third book, Investigations [Kauffman, 2000], my own attempt to define agency stated that a molecular autonomous agent was a self-reproducing system that is able to do at least one thermodynamic work cycle. With Philip Clayton, we broadened this definition to involve the inclusion of the self-reproducing system in some boundary, say a liposome, and the capacity to make at least one discrimination, food or not food, and to “act” upon that discrimination [Kauffman & Clayton 2006]. Bacteria clearly do this, and, without invoking consciousness, are therefore agents. Agency is real in the universe. A rudimentary beginning of “emotion” emerges here [Piel, 2012]. The bacterium must sense its world and act to avoid toxins and to obtain food. The evaluation of “good” versus “bad”, arguably the “first sense”, enters here. Agency and the existence of the cell precedes this “semiotic” evaluation logically, for if there were no existence in the non-ergodic universe of the Kantian whole, agency and evaluation of food versus poison would not be selected, and so they would not exist in the universe. Thus, I would argue that life is not sufficiently based on semiosis, for, as noted, if there were not a prior Kantian whole existing in the non-ergodic universe above the level of atoms, semiosis would not have evolved. I note also that Hume’s famous: “one cannot deduce an ‘ought’ from an ‘is'”, the famous naturalistic fallacy, rests on a critical fallacy that Hume, like Descartes, thought of a mind “knowing” its world. Hume did not think of an agent “acting” in its world. Given “action” and “doing”, doing “it” well or poorly enters inevitably, and with it, “ought”. With ought, the need for evaluation, the rudiments of emotion without positing consciousness, enter. “If one doesn’t have a concept of an object, one can’t recognize it,” insisted mathematician René Thom in To Predict is not to Explain, a set of interviews published in 1991 in French and 2010 in English. Thom is generally credited with the terms attractor and basin of attraction, concepts that are fundamental to chaos, complexity, and resilience theory, and as I noted last time, are now used to map galactic superclusters. Although Thom is little discussed these days, he was once widely celebrated. He received the 1958 Fields Medal and inspired both a 1976 film by Jean-Luc Godard and 1983 paintings by Salvador Dali, who portrayed Thom’s ideas about discontinuity, often called catastrophe theory, in his final works. What happened to Thom and catastrophe theory? I’ve collected a few notes. “[C]atastrophe theory was propelled on a wave of hype and enthusiasm during the mid-1970s only to die out in bitter controversies by the end off the decade,” wrote David Aubin in a chapter on Thom in 2004’s Growing Explanations: Historical Perspectives on Recent Science. “[C]atastrophe theory did not live up to its promise of useful predictions,” asserted George Johnson in Thom’s 2002 NYT obituary. The visual language of discontinuity is represented (1) on the left, in a figure I’ve redrawn from Marten Scheffer’s 2009 Critical Transitions in Nature and Society (p.267), describing “a disturbance pushing the system across the border of a basin of attraction,” and (2) on the right, in Dali’s The Swallow’s Tail, depicting what Thom called the swallowtail and cusp (low-resolution, fair-use image from Wikipedia, © Salvador Dalí, Fundació Gala-Salvador Dalí, Figueres). Analogies and metaphors, contrary to the popular opinion that considers them flexible or just approximations, impress me as exemplifying strict relations, ones which can, in many cases, be given exact mathematical expression. To Predict is not to Explain, interviews by Emile Noël, translated by Roy Lisker, edited by S. Peter Tsatsanis, is currently available as a pdf at Roy Lisker’s website. It is clear from his [Thom’s] 1990 unpublished article, ‘On attractors’, that the word ‘attractor’ was used by him in 1966. Thom says that Steven Smale [Stephen Smale] might have used it before then although Smale says it was Thom that coined the neologism ‘attractor’. The notion of a ‘strange attractor’ came later when chaotic systems were being studied. For more on Dali’s The Swallow’s Tail, see the Gala–Salvador Dali Foundation, the Stockholm Resilience Centre, and an appreciation by Stephen Parker. A remarkable pair of videos, posted a couple months ago, describe research by R. Brent Tully and colleagues to map out our region of the universe and its change over time. That’s from the voice-over to the more filmic of the video pair, which has garnered 2.5 million views to date. The second, more technical video is above, and the associated paper was published in Nature. Brad Plumer reported the story on Vox. In addition to the cosmic scales and graphic simulations, one aspect of the research and videos that caught my attention was their use of concepts familiar from the modeling of complex systems: attractors and basins of attraction. “We call the watershed feeding our basin of attraction the Laniakea Supercluster.” In other words, within the basin of attraction that is used to describe Laniakea, galaxies flow toward a “Great Attractor” at its dense center, while in the neighboring supercluster of Perseus-Pisces, galaxies flow toward its attractor. The use of attractor concepts in describing superclusters is another example of the trend toward systemicity across numerous fields of contemporary science. Portland-based artist Dana Lynn Louis has a wonderfully immersive show called “clearing” at the Lewis & Clark Hoffman Gallery, on exhibit until December 14. On the afternoon of November 16, there will be an immersive conversation as well. Please join us for a facilitated dialogue on “clearing,” the subject of the 2014 Hoffman Gallery show by Dana Lynn Louis. This afternoon of conversation will feature a panel discussion with Ms. Louis, followed by small-group discussions in which you are invited to participate. Together, we will explore the varied meanings of clearing – as understood through our professional practices, through our personal experiences, and through our impressions of the artwork on exhibition. In particular, we hope to trace links between art, social justice, and the natural environment. Panelists include: Kathleen Maloney (legal consultant, American Society for the Positive Care of Children; professor in international criminal law, Lewis & Clark), Ethan Seltzer (professor in the School of Urban Studies and Planning, and interim director for the School of Art+Design, Portland State University), Howard Silverman (instructor in systems thinking, Pacific Northwest College of Art). The afternoon’s facilitator will be Tod Sloan (professor of counseling psychology, Lewis & Clark). I’ve been writing about design for a chapter in the SAGE Handbook of Action Research (3rd Edition, to be released next year). Design, that is, in the broad sense. Design as “plan[ning] for something new to happen,” per Nigel Cross’s 2011 book, or as “creat[ing] possibilities,” per Klaus Krippendorff’s 2007 paper. So when I recently re-watched An Ecology of Mind, Nora Bateson’s documentary film about her father, I couldn’t help but think about Gregory Bateson as a design extraordinaire. These are my slides for a talk with Jeff Bloom’s class on An Ecology of Mind, in the College of Education at Northern Arizona University. 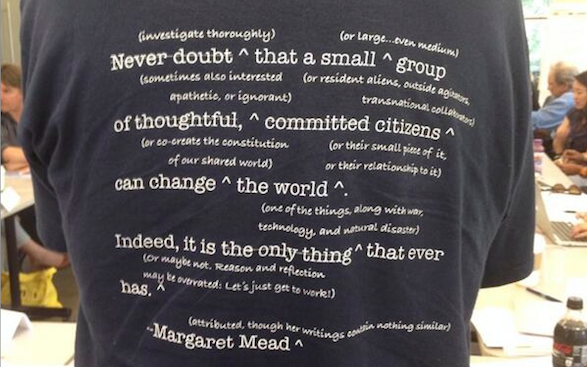 In my experience, the famous Margaret Mead quote elicits widely divergent reactions. At the same time, the claim by the t-shirt’s creator that Mead’s “writings contain nothing similar” caught my attention. To be sure, the attribution is disputed. Still, Mead did write about these topics. How similar is similar? You be the judge. Glancing through Mead’s 1964 Continuities in Cultural Evolution, the primary theme is indeed the significance of the “small group” in the processes of cultural change. To get a sense of what the book is about, I’ll suggest a comparison. Think of it as a 60s version of Steven Johnson’s Where Good Ideas Come From. Like Johnson, Mead’s sensibility is evolutionary. She’s writing about how cultures evolve, not about how activists might intervene to “change the world.” In a word — today’s omnipresent buzzword — both Mead and Johnson are in search of innovation. They wonder and examine what types of cultural contexts afford the rapid emergence of social innovations. If we are indeed to participate in evolution not merely by creating new technology, new medical techniques, new kinds of foods, and new forms of communication, but more specifically by participating in the very process of cultural creation, what hope does our accumulated experience of the last thirty years give us? Today, our experiences have accumulated further. Johnson can draw from post-Mead research on complexity theory (e.g., the adjacent possible) and network theory (e.g., strong and weak ties). Still, Mead and Johnson come to strikingly similar conclusions. Examples of good environments for incubating good ideas, according to Johnson: the lab meetings where researchers exchange information (e.g., in Kevin Dunbar’s research), Freud’s salons, Paris cafés. I find myself returning to the model of the city or the great university and to the model of the meeting place to which certain people go often enough so they may hope to meet one another but not so often that the element of surprise and excitement is lacking. In the modern American setting, seminars and small shared projects (provided these do not become a new set of confining walls within which development is subordinated to the timely completion of the project) replace the cafés and coffee houses that we have never been able to reproduce. Fifty years later, the city is widely celebrated, America finally has coffee houses, and designing for creative interactions has become an industry in itself. I wonder what she’d think. The unit of cultural micro-evolution is a cluster of interacting individuals who within the special conditions provided by period and culture make choices which set a direction — a channel — in which events tend to flow until other points of divergence are reached. Similar? I love the t-shirt regardless of the similarities I see. As for Mead’s personal clusters, two are about to gather again. Today begins the 58th meeting of the International Society for System Sciences, next week is the 50th anniversary of the American Society for Cybernetics. Not changing the world, that’s for sure. “Making choices [that] set a direction” is ambitious enough for any group of thoughtful, committed citizens. There’s more about the quote at the website of the defunct Institute for Intercultural Studies, which Mead founded, and more about evolutionary clusters in Steve Joshua Heims’s The Cybernetics Group, which tells a story of the Macy Conferences, where Mead was a key participant.